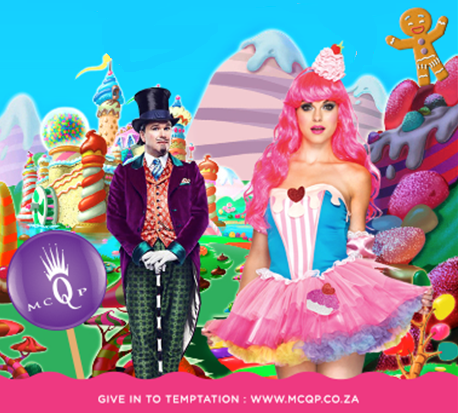 MCQP is the one party I never miss… To me, it really is the party of the year. I mean you get to dress up, the crowd is always fun, and they go all out on the venue, decor and DJ lineup. This year I’m extra excited though, because I freakin’ love the theme. What is it? Candyland! The other extra cool thing is this year’s venue. They’re shutting down Harrington Street people. That’s right, an entire street. There will be 8 music areas laid out across the space including Assembly, Dragon Room and other venues in the street – each with its own theme and music style. Choose between the live bandstand stage, Disco, EDM, House, Cabaret, Trance, Diskotekah, Crew’s Commercial floor and the Ladies only dance floors. Partygoers will also be treated to a whopping 110 local & international DJs, artists and performers including Dean Fuel, Jamie Saint, DJ Chadd, VJ Karl, DJ Cambis (who’s coming out from Germany), as well as Stuart Hillary of Jozi’s historic Therapy club fame and Cape Town’s 80’s guru, Sam Roy. The gates open at 5pm, and there will be food offerings, stalls, various bars and many more “cherries on the top”. Tickets cost R390 for general access and R950 for their “Quality Street” option which gives you an open bar all night long. Tickets? Are available over here.